Marine & Boat Insurance in Spain for all types of marine craft from Kayaks to super Yachts, we do it all! As we are sure you can imagine, with Spain virtually surrounded by water, boats play a major part of the Spanish and Expat culture. Every conceivable type of boat from the small inflatable dinghies to the larger commercial ferries and passenger ships ply the Mediterranean waters of our coastlines. There are hundreds of Marinas along these shores and although there is a relatively large fishing fleet, most of the water crafts tend to be for private use. Sailing yachts and speed boats can be seen bobbing about. Most shoreline areas are cordoned off to pleasure craft during the tourist seasons to ensure the safety of swimmers. A large number of coastal towns have areas for rental boats, jet skis and private speed boats as well as a large variety of yachts. Small private marinas also provide facilities such as restaurants and bars which are regularly frequented by the locals and Expats alike. Having boat insurance is a legal requirement in Spain and you must ensure that you keep a copy on board at all times. The local Police or Guardia Civil regularly patrol the seas and the marinas and will regularly check your documentation, not just for insurance but for the correct boat documentation and safety equipment as well. Gone are the days of anyone just being able to launch a boat and go out fishing. Regulations and inspections are the new format adopted by the local authorities and although they are allowing foreign registered boats to use these waters, they are tightening the regulations to ensure that all craft are seaworthy and have the correct documentation. www.insuranceinspain.com can provide you with all kinds of Boat and marine insurance, from small skiffs, rowing boats, canoes, small engine powered crafts, ski boats, jet skis, sailing dinghies, yachts, charter boats, rental boats and virtually anything that floats on water. So please give us a call on 0034 965 27 57 27 and we will be happy to discuss any of your marine insurance requirements and provide you with a quotation to suit your needs without any obligation. We are here to help, so please use our services. Mandatory civil liability insurance, with a sum insured limit of 336,566.78€. Death or bodily injuries to third parties: 120,200€ with a maximum limit per claim of 240,400€. Material damage and economic loss: 96,161€. Voluntary public liability insurance, which extends and complements the mandatory public liability insurance limits. Damage to the boat itself, covering: the hull, engine, sails, masts, auxiliary craft, special fixtures and equipment, personal belongings and trailer. Claim for damages, caused by third parties to the insured boat or to any of its occupants. Total theft of the boat and/or its auxiliary craft. Damage due to coastal regattas in Spanish territorial waters. Accidents: loss of life or bodily injuries of occupants while on-board the insured boat or when boarding and/or disembarking from the insured boat are covered. Insuring Canoes, Kayaks and Paddleboards in Spain. There are a variety of insurance covers available for Kayaks, canoes and paddleboards in Spain that will cover you for third party liability insurance, loss and theft, and personal accident and injury. Insurance for personal accident and injury for using Kayaks, Canoes, Paddle-boards and other water craft and water based activities can be covered quite easily with our affordable sports and leisure insurance from as little as €79.43 a year. – Track and field, biathlon, triathlon, pentathlon. – Basketball, handball, volleyball and beach volleyball. – Hunting, including shooting and fishing. – Skiing and snow boarding on ski slopes. – Football, indoor football, 7-a-side football, beach football and field hockey. – Gymnastics, bodybuilding and weightlifting. – Swimming and water polo. – Tennis, paddle, squash, badminton, table tennis and pelota. – Surfing, windsurfing, water skiing and recreational sailing (on a sailboat, on a yacht or jet ski) up to 12 miles from the coast. – Scuba diving to up to a depth of 30 metres. Need a boat licence in Spain? Then look no further. wwww.insuranceinspain.com have teamed up with www.seaschoolcostablanca.com to bring you an exciting day out in Altea to introduce you to the boating world and keep you legal with a Royal Yachting Association appointed representative to take your RYA boat licence examination and practical with on the water experience. Based in the spectacular bay of Altea, sea school costa blanca will bring the theory and skills and knowledge to safely and confidently handle powerboats in Spain. CLICK HERE for more details or call Dave Hill on 0034 622052938. We often get asked if we know of any boat delivery companies. We do, and we can provide insurance to cover your boats, jetskis and any watercraft based in Spain or in the UK. We are hoping to provide a comprehensive list and provide the links for your information. One of our personal recommendations for having your boat collected from the UK to Spain is https://www.furnishinspain.com/index.php/south-coast-removals They also do removals for lots of other things like furniture and if your moving to Spain, they are the people to contact. SEASCHOOLCOSTABLANCA Can provide the moving or delivery of your boat from Marina to Marina along the Costa Blanca. 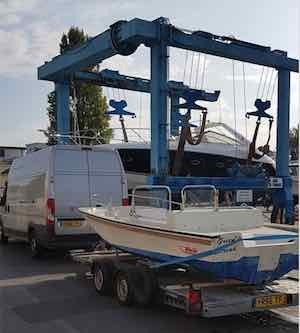 So if you need to move your boat and don't fancy doing it yourself, then call Dave Hill on 0034 622052938 and i am sure he will be happy to provide a quote for the delivery service. CLICK HERE to go to their Facebook page or CLICK HERE to go to their website. www.insuranceinspain.com are happy to discuss any of your marine insurance requirements as we insure many vessels in Spain from smalldinghies and tenders, to fully fledged ocean going yachts that travel the Mediterranean. Please call 965 27 57 27 in the first instance. Contact us on our website or online chat with us and one of our marine specialists.